What are Chick and Chickie doing in this story? Why do they have paint, string and paper in the beginning, and what do they make with them? Ask students to retell the ‘A’ story, what makes the ‘A’ laugh? Look at page 20, and see if students can predict what will happen on page 21)? What makes the ‘A’ afraid? Look at page 26, and see if students can predict what will happen on page 27? Who are Chick and Chickie and how can you tell the difference between them (hair, color, bottom of their feathers)? Are the two characters friends? What information can you use to figure out their relationship? Have students identify what they think a “mask” is. What is the difference between a mask and a face? What are Chick and Chickie doing when they “look scary” to the A (page 27)? Why would the A be scared of them and what details can you use on page 26 to make your inferences? Explain to your students what a comic is, showing them how it is different from a picture book. Point out details like speech balloons, panels, etc. 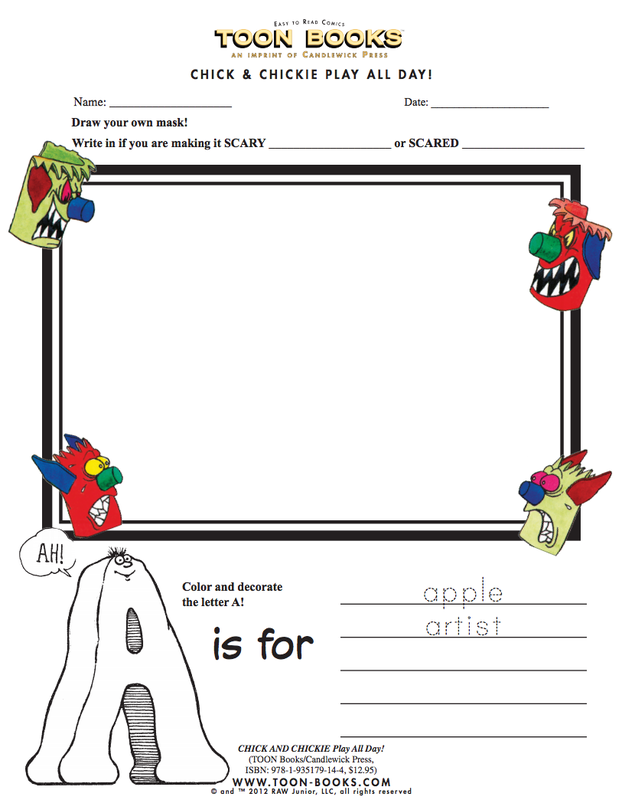 Give students instructions and materials to make masks, and then have them write their own instructions for making a scary mask. Have students name the author of the book. Explain that in comics, the author of the book can also be the illustrator. When is Chick speaking, and when is Chickie speaking? How do you know? Explain how in speech balloons, the tail points towards the person who is speaking. Look at the pages 7 and 9, where Chick and Chickie put on their masks and yell, “BOO!” How does Chick or Chickie feel when the other puts on his mask and yells? How can you tell from the picture? Have students list specific details (hands to face, drops of sweat, etc). On page 12, how have the masks changed? Use the information you’ve gathered from the earlier pages to draw a conclusion. At the end of the story, the A runs away. Why? Compare his experience playing with Chick and Chickie with their experience. Have students go through the ‘A’ part of the book. Split them into groups of three, with one person reading Chick, another Chickie, and the last the ‘A.’ Read the lines out loud, then switch who is reading each character’s lines. Give each student a different letter. Have them write at least five different things they could do to that letter, and then have them draw pictures of the letter to show how it feels as a result. During Reading Ask students to keep their masks close at hand. Read pages 5-13 aloud and together. At the end of page 13, ask students to take a minute to share their masks with each other, and ask if the masks are ‘scary’ or ‘scared’. When students are done sharing their masks, like Chick and Chickie did, ask if there are any volunteer who want to share their masks with the entire class. After Reading In small groups, provide students with materials to finish their activity sheet, by coloring and decorating a letter A of their own. Help brainstorm and write words that begin with the letter a, like “ant” or “apple.” Optional: cut out the letter A and encourage students to have fun and use it as a prop to act out their group’s idea of playing with the letter A.